"[ ] even if/without [ ]." Now, in many cases, this first part alone can make for a clear, relevant, attention-grabbing headline. This second part gives you some extra wiggle room to differentiate yourself from your competitors in a way that matters to your customers, which obviously is hugely important in highly competitive markets. As an example, let's grab a product from Kickstarter to see how this formula works. Point, "the friendly home alarm" is a trending product that uses environmental sensors & machine learning to alert you of suspicious changes in your home. "Just imagine if you could finally ..."
You can see how in each of the headlines I crafted above, the first part is always a specific desirable outcome, and the second part highlights a specific objection. Now you might be wondering: why is appealing to desirables outcomes so important? 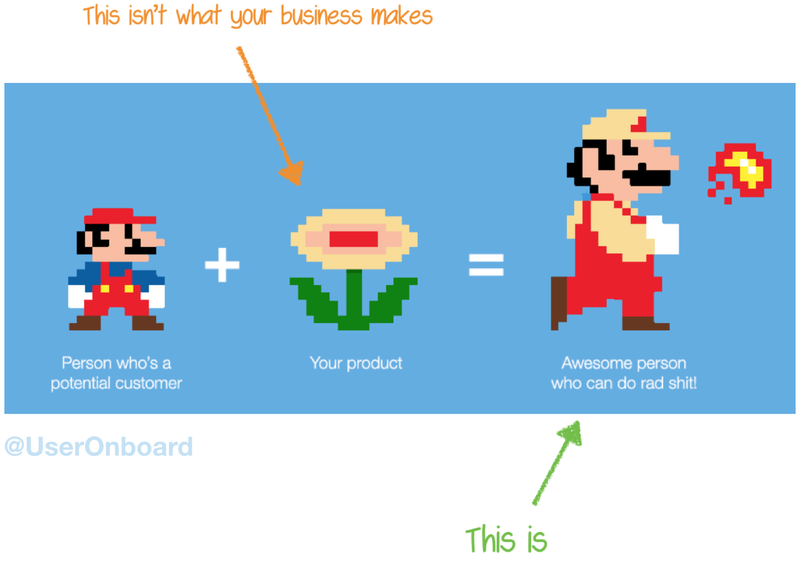 Personally I think UX designer Samuel Hulick said it best (and possibly illustrated it best with his adorable Mario Bros.'-themed graphic): "People don't buy products, they buy better versions of themselves." If a product doesn't promise a specific desirable outcome your customer wants, they aren't going to buy it. Think about it: People don't buy sofas, they buy the comfort and relaxation the sofa will bring into their lives. Clearly, an uncomfortable sofa will never sell well, no matter what kind of ad campaign you run to sell it. When people shop around for products, they might switch back and forth between dozens of brands before making a final decision. But even when they're in this ruthless "comparison-shopping mode", they will always remain intensely loyal to the desired outcome they want. Remember: Products come and go, but the outcome your customer desires is always NON-NEGOTIABLE. So if your product's headline promises the acquisition of said outcome (in a credible way), you've officially got their attention. Unfortunately, when you're working on building and selling a product day in and day out, it becomes all-too-easy to completely lose sight of the desirable outcomes your customers actually care about. That's why I love the 6/49 Headline Formula sooooo much: it gets you focused on what matters most to your customers immediately. Give it a try with your own product and see how it changes your headline-writing mindset! * I call this the 6/49 Headline Formula because, just like Lotto 6/49's famous tagline ("Imagine the Freedom") and its ad campaigns over the years, it focuses on the fantasy outcome that results from buying the product, rather than the product itself. You'd think that in order to sell lottery tickets for a multi-million dollar jackpot, the marketers for Lotto 6/49 would have just run ads that just showed people swimming Scrooge McDuck-style in vaults full of cash. But they've always known better. Instead, they focus their ads on the emotional-charged achievement of bucket-list fantasies, like owning a yacht and sailing the world, taking dream vacations with friends, and driving luxury vehicles. ** Ideally you should be grabbing these top desired outcomes and top objections from actual voice-of-customer research, such as survey data or one-on-one interviews.